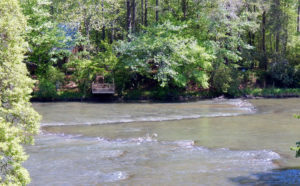 The Tuckasegee River, often referred to as the “Tuck” by locals, is a river located in Western North Carolina that is well-known for its many fishing weirs, or fish traps, that were used by the Cherokee to catch fish. 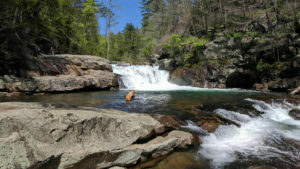 The Tuskasegee originates near Cashiers, NC in southern Jackson County and runs through Sylva, Dillsboro and Bryson City before joining Fontana Lake and the Little Tennessee River. 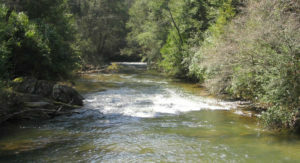 This gentle river offers anglers abounding trout habitat areas, pools, runs and riffles. 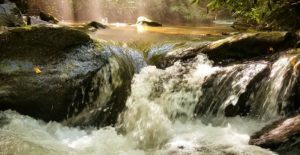 In addition to Rainbows and Browns, some of the other fish that are sometimes seen on the Tuck include Smallmouth & Largemouth Bass, White Bass, Rock Bass, Walleye, Catfish, Sunfish, and Crappie.